Can't get the image of Julie Andrews and Yul Bryner waltzing in that great movie - The King and I. The current king is very well-liked here and street signs proclaim, "We love our king". His photo is in most shop windows. Arrived in Bangkok around 1 a.m. Sunday morning Bangkok time after 32 hours of continuous travel. Wow, that takes it out of you. Popped a Melatonin and much to my surprise slept soundly and appear to be on Thai time now. Chris, Annie's Mom, joined me on this trip but it was a surprise for the kids. We didn't travel all the way together - met up in Tokyo. It was fun to see their faces when they opened the door to me Sunday morning and found Chris there too. Maxine is delighting in having two "G'Mas" at her call. Sunday was spent exploring the hotel surrounds and re acquainting with Maxine, now 2, who I last saw in July in South Africa. She talks a mile a minute, it very independent and charming. Annie's due date is today but despite spicy food, foot reflexology and long walks - that baby is not about to be launched in a hurry. We visited the hospital this a.m. - more like a five star hotel than any US hospital I've seen. Whole ground floor is full of chic little restaurants, coffee shops - even a Starbucks. First impressions of Bangkok - clean; well organised; traffic follows rules; people universally smiling and polite. Striking modern skyscrapers dominate the skyline with an occasional gaps through which the elegant and distinctive old buildings can be glimpsed. Lot's of cupolas extravagantly scrolled and decorated; shrines with intoxicating scents of incense every few feet, and elephant motifs everywhere. Street food is tempting but I have yet to succumb. The three restaurants I've been to have been inexpensive and the food wonderful. Have sampled a fantastic salad of prawns, pomelo, toasted coconut and a spicy sauce; steamed sea bass in lemon grass and coconut "soup" and cold noodles in a hot sauce. All very good. I'm glad my studio apartment is only a one floor elevator ride to the in-house gym and I did my treadmill cardio this a.m. watching BBC World News on the monitor, and Bangkok come awake through the window. I navigated taxi and streets today to learn the route to Maxine's school - traffic is congested and there are scores of small engine motor bikes - some piled high with baskets heading for the markets and others with two or more passengers. 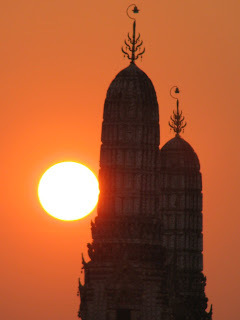 This evening we plan on a river cruise to watch the sunset light up the temples along the river bank. I like this city and can see why it attracts so many fans from the western world.